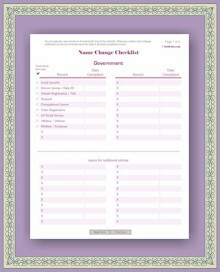 You can make a list of everyone you plan to notify of your new name. This will help organize your entire process. The existing entries will help you generate your own set of contacts. Don't worry about being perfect on the first go around as you may think of other names and entities to add to your list as time goes by. When you finish a notification write the date in the space provided. The entries can be done on your computer or by hand. If you're using the computer please note that data can't be saved so you will need to print it before you close the file. For this reason we recommend that you do one page at a time.